Years ago jewellery was worn for its magical properties – for protection, luck, wealth, and love. By the Roman era, most of the gemstones that we use today had been discovered, and the magic behind these stones was the rule of the day and was treated with great respect. Cast your mind back to 18th century Paris, a city of beauty and love and an era from which Acrostic Jewellery first emerged. Acrostic Jewellery is a trend that uses birthstones and symbolism to tell a story with each gemstone representing a letter of the alphabet. A for Amethyst, B for Beryl, C for Citrine, D for Diamond and so on. This was hugely popular in the Victorian era, and still, today there is a little something appealing about this old-school romantic jewellery style. After all, who wouldn’t want to wear a piece of jewellery that has been carefully embellished with a secret message coded in precious birthstones, telling a tale of love and romance between gifter and wearer? Now that’s a gift sure to tug at the heartstrings. Each month is represented by a precious birthstone, and each holds its’ very own legend and meaning. For those born in January, you are lucky to have the Garnet as your precious gem, a stone of love and devotion. A deep crimson colour and believed to bring order to chaos and is rumoured to be a protective stone, helping to protect the wearer from evil. As an ancient symbol of friendship that is said to encompass everlasting affection, choosing the garnet to be embellished on your Birthstone Initial Necklace makes for a very treasured give for that special someone. The Amethyst is the stone of February, a gem of divine lilac tones. Said to strengthen relationships and to signify peace, serenity, and temperance. The Amethyst gemstone coupled with a hand engraved initial on our personalised Birthstone Initial Necklace is the ideal gift for those February babies. March’s birthstone is the Aquamarine, embodying all things connected to the sea. Legend has it that the Aquamarine originates from the treasure chest of mermaids. 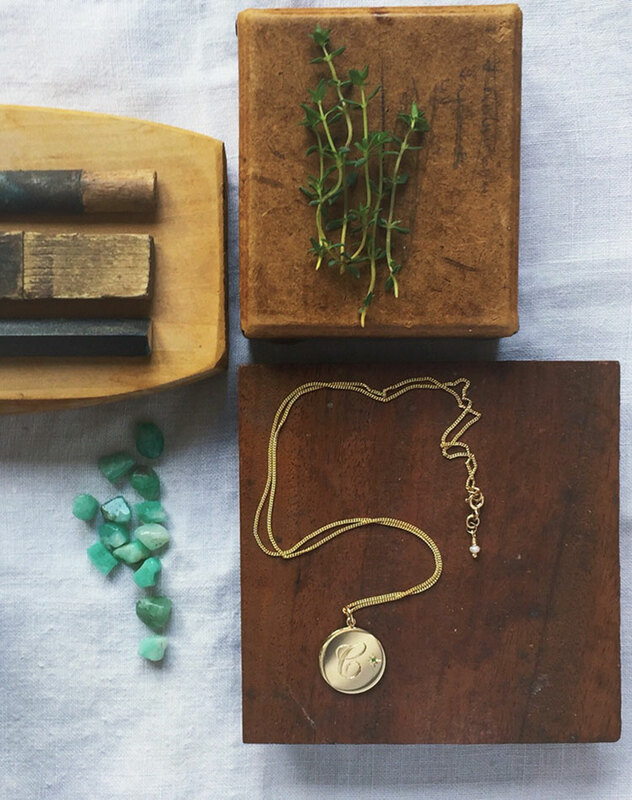 The wearer of the Aquamarine gemstone will carry feelings of friendship, harmony, and trust, a great sentiment to wear and give with our Birthstone Initial Necklace. Perhaps one of the most precious gemstones of all, the Diamond is the stone for those oh so lucky April babies. The Diamond has been known since antiquity as a stone of invincibility, as well as a symbol of eternal love. Ancient myths and theories about the magic powers of Diamonds believe that they were the tears of God, while others claim that lightning bolts formed the sparkly diamond. Choose the Diamond to be embellished on the Birthstone Initial Necklace to show just how much you love someone, after all, they deserve it. For those May babies, the deep green Emerald is your birthstone. History tells us that the Emerald was a stone worshipped by the Incas and was considered a symbol of eternal life in ancient Egypt. Said to protect from danger and to provide the wearer with a strong heart, great values to be carried around one’s neck. Stuck on a gift for a birthday in May? Then the Birthstone Initial Necklace personalised with a brilliant cut Emerald is the remedy for you and is sure to be a treasured gift. The unique Alexandrite gemstone is for those born in June, a stone associated with balance, confidence, and joy. It has a remarkable ability to dramatically change colour in different lights. If your loved one brings you joy and happiness into your life, then the Alexandrite Birthstone Initial Necklace is ideal. The Ruby is the gemstone for those born in July, considered the king of gems with deep associations with elegance, royalty, and glamour. Legend has it that wearing an elegant red Ruby will bestow good fortune on its owner. As a source of fantastical stories through the ages, the ruby is also known as the ‘firestone’ its strong red hues shining through even the thickest clothing. If you give our Ruby Birthstone Initial Necklace as a gift, it is said to resemble a symbol of true friendship. August’s birthstone is the Peridot, a symbol of happiness and compassion. The wearer of the Peridot is said to host magical powers and can bring power, influence and a fantastic year. The myth behind the stone is that the Peridot symbolises the tears of Pele, the Hawaiian goddess of fire and volcanoes. For the August Birthstone Initial Necklace, the Peridot is the stone for you. The September Sapphire is a deep shade of blue believed to bring hope, faith and divine favour. The Sapphire symbolises learning, purity and wisdom and the clarity of its blue is said to bring order and healing to mind. The blue stone of the September Birthstone Initial Necklace is a great reminder of those sunny blue skies with the turn from summer to autumn. The month of October is resembled by the Pink Tourmaline gemstone, a gentle stone that touches the heart. Treat those you love most with the Birthstone Initial Necklace embellished with this gem, a friend full of love and care, and she is sure to appreciate the aura of sophistication and gorgeous colour of this gemstone. For those born in November, the Citrine is this months birthstone, a stone that unleashes inner creativity and expression. Thanks to its golden colouring, the Citrine is considered to be energising like the rays of the sun. Give the ray of sunshine in your life a Birthstone Initial Necklace and show them just how much you appreciate them and the joy and happiness they bring in your life. And last, but by no means least, December’s birthstone is the Topaz. The Blue Topaz is said to be the perfect stone for intellectuals, as it promotes higher thought and cognition. An excellent stone for those born in this Winter month, or lovers of the season, with its light blue colouring reminiscent of walks in the snow and cold icicles all around. A beautiful stone to choose to embellish your Birthstone Initial Necklace. Choose any of the above gemstones that are personal to you or the recipient and an initial of your choice. Can’t select which initial to be hand engraved? Well, we have just the remedy to this, with our gorgeous Double Initial Necklace or Triple Initial Necklace new to our personalised jewellery collection. 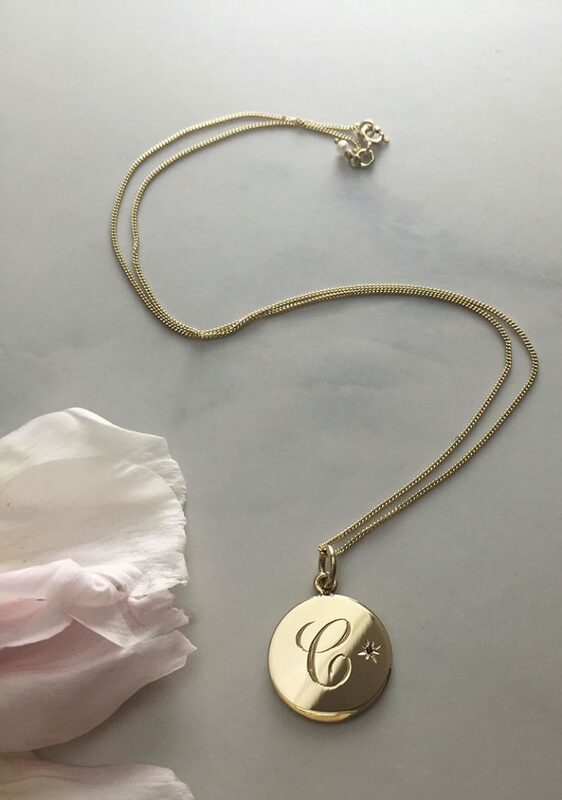 Why not get the initials of her full name hand engraved to make the Birthstone Initial Necklace all about her or initials that carry meaning to you both, perhaps yours and her initial or members of your family. Another alternative is to double up with a disc charm for each of you, or each child with our Double Disc Initial Birthstone Necklace. Not only are layered jewels are hot on trend, but they are perfect for mums to add Birthstone Initial Disc Charms to her necklace as her family grows. Want more that one birthstone? So we have alternatives if you would love to have more that one initial on your Birthstone Initial Necklace, but what if you want a lil’ extra sparkle with more gemstones? If you would like to embellish your disc with more than one birthstone, email us with your special request and we can certainly help. This can make a great necklace for a mum to celebrate family love. 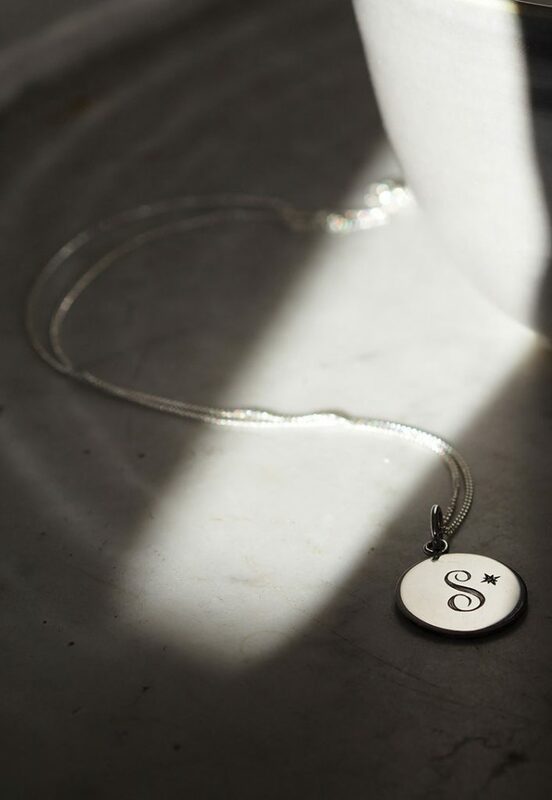 Choose to engrave her initial, then surround the initial with a precious gemstone to represent each family member, a collection of birthstones that together tell the story of your family. A great way for a mum to carry each of her most loved ones closely. 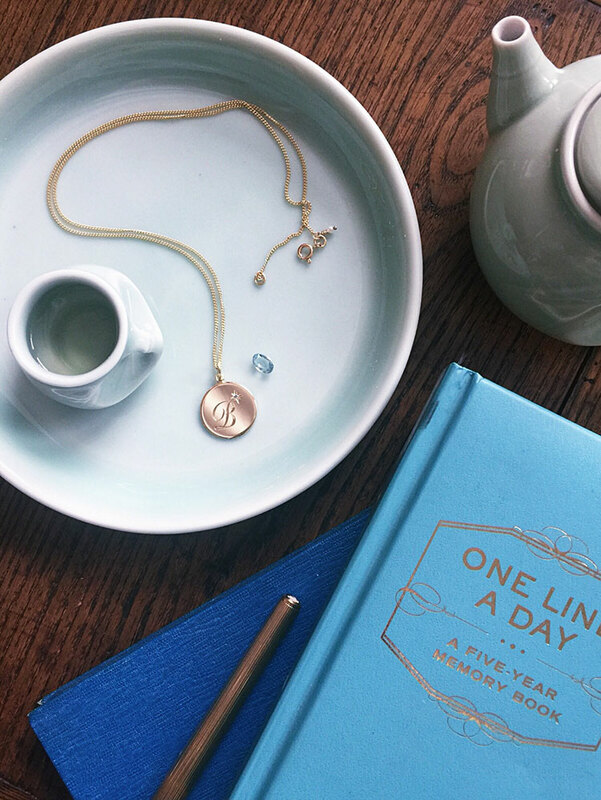 Birthstone Initial Necklace… a personalised gift to melt any mother’s heart. Our Birthstone Initial Necklace collection is available in each of our precious metals, sterling silver, yellow or rose gold and also solid gold, to suit all preferences of jewellery lovers.